bones return to their normal position, forcing air from the lungs. THE PROCESS OF RESPIRATION The rhythmical movements of breathing are controlled by the respiratory center in the brain. Nerves from the brain pass down through the neck to the chest wall and diaphragm. The nerve that controls the diaphragm is called the phrenic nerve; the nerve that controls the larynx is the vagus nerve; and the nerves that control the muscles between the ribs are the intercostal nerves. The respiratory center is stimulated by chemical changes in the blood. When too much carbon dioxide accumulates in the blood stream, causing the blood to become acidic, the respiratory center signals the lungs to breathe faster to get rid of the carbon dioxide. The respiratory center can also be stimulated or depressed by a signal from the brain. For example, changes in one's emotional state can alter respiration through laughter, crying, emotional shock, or panic. The muscles of respiration normally act automatically, with normal respiration being 14 to 18 cycles per minute. The lungs, when filled to capacity, hold about 6,500 ml of air, but only 500 ml of air is exchanged with each normal respiration. This exchanged air is called tidal air. The amount of air left in the lungs after forceful exhalation is about 1,200 ml and is known as residual air. THE NERVOUS SYSTEM LEARNING OBJECTIVE: Identify the components and function of a neuron, recall the process of impulse transmission, and identify the components and functions of the central and peripheral nervous systems. The activities of the widely diverse cells, tissues, and organs of the body must be monitored, regulated, and coordinated to effectively support human life. The interaction of the nervous and endocrine systems provides the needed control. The nervous system is specifically adapted to the rapid transmission of impulses from one area of the body to another. On the other hand, the endocrine system, working at a far slower pace, maintains body metabolism at a fairly constant level. In this section, you will study the neuron, the basic functional unit of the nervous system. Also, you will study the components and functions of the different divisions of the nervous system. The nervous system is divided into two major groups, the central nervous system (CNS) and the peripheral nervous system (PNS). Another division of the nervous system is the autonomic nervous system (ANS), which is further subdivided into the sympathetic and parasym- pathetic nervous systems. THE NEURON The structure and functional unit of the nervous system is the nerve cell, or neuron, which can be classified into three types. The first is the sensory neuron, which conveys sensory impulses inward from the receptors. The second is the motor neuron, which carries command impulses from a central area to the responding muscles or organs. The third type is the interneuron, which links the sensory neurons to the motor neurons. 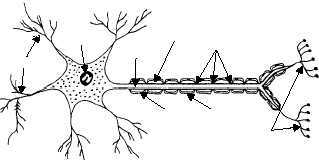 The neuron is composed of dendrites, a cyton, and an axon (fig. 1-42). The dendrites are thin receptive branches, and vary greatly in size, shape, and number with different types of neurons. They serve as receptors, conveying impulses toward the cyton. The cyton is the cell body containing the nucleus. The single, thin extension of the cell outward from the cyton is called the axon. It conducts impulses away from the cyton to its terminal branches, which transmit the impulses to the dendrites of the next neuron. Large axons of the peripheral nerves are commonly enclosed in a sheath, called neurilemma, composed of Schwann cells (fig. 1-42). Schwann cells wrap around the axon and act as an electrical insulator. 1-36 HM3F0142 MYELIN SHEATH AXON CYTON DENDRITES NODES OF RANVIER NEURILEMMA SCHWANN CELL TERMINAL BRANCHES Figure 1-42.The neuron and its parts.